Scotsman John Anderson, though little-known, was an engineer who helped make the British Empire possible. He was one of the most important engineers in Victorian Britain, producing armaments for the British Army and Royal Navy, institutions that underpinned the Empire in the mid-Victorian period. He judged entries at many international exhibitions later in life, and was knighted for this service. Anderson's father died three months before he was born and his upbringing was greatly influenced by his step-father, Irvine Kempt (1782-1859), a blacksmith at the local cotton mills. Twice a week Anderson walked to Aberdeen to attend evening classes at the Mechanics Institute. He also participated in the local debating society and became librarian of a newly-established library. After completing a seven-year mechanic's apprenticeship at Kempt's factory, he moved to Manchester and then London where he was engaged by David Napier (1790-1869), a Scottish ship and engine builder with a factory of his own. Napier seconded him to the Royal Arsenal, Woolwich, to take charge of brass gun manufacture. This was the start of Anderson's 30-year involvement with the Royal Arsenal. Anderson was responsible for many innovations, and for mechanising and automating the manufacture of cannon, projectiles and explosives used by the armed forces. He became the Royal Arsenal's first Chief Mechanical Engineer and organised it for the manufacture of heavy armaments. 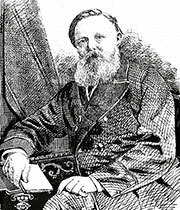 In 1859, he assisted William Armstrong (1810-1900, Sir William from 1859, Baron Armstrong from 1887) for the manufacture of the Armstrong Cannon at Woolwich. During the Crimean War (1853-6) he enlarged the Royal Arsenal, designed new machinery and produced the armaments needed by the army. He also equipped a ship, HMFF Chasseur, as a floating factory. She was sent to Balaklava in the Crimea to service the army's increasingly extensive and sophisticated mechanical equipment. The Royal Arsenal would continue to use many of Anderson's buildings and machines for many decades after his retirement. Arms manufacture ceased on the site in 1967. In 1854, Anderson visited the USA to inspect small arms manufacturing installations before designing a new mechanised factory for the government's arms manufacturing site just north of London. The Small Arms Factory, Enfield kept up production into the 20th century, through both world wars. Between 1862 and 1878, Anderson was Juror of Machinery for International Exhibitions in London, Vienna, Philadelphia and Paris — and appointed president of the jury for the last two, for which he was was granted a knighthood (1878). He had also received honours from the Austrian and French sovereigns. He was elected a Vice-President of the Institution of Mechanical Engineers (1868) and a Fellow of the Royal Society of Edinburgh (4th December 1871). When he retired in 1872, he moved with his wife Eliza (1815-93) to St Leonard's-on-Sea in East Sussex. He donated (1883) a public library to his birthplace. Anderson died in 1886 and was buried in Aberdeen. His elder son, who was a clergyman, erected (Anglo-Catholic) memorials to him in Mary Tavy Church, Devon, England. 1839 Moves to England, finding employment in Manchester and then London, where he works for David Napier. 1842-72 Works at Royal Arsenal, Woolwich : Foreman 1842-8, Engineer at Royal Brass Foundry 1848-59, Assistant Superintendent at Royal Gun Factory 1859-66, Superintendent for Machinery 1866-72. Eventually Chief Mechanical Engineer. 1853-6 Enlarges the Arsenal during the Crimean War, and equips HMFF Chasseur. 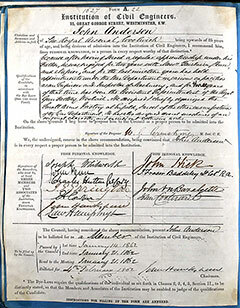 John Anderson was elected Member of the Institution of Civil Engineers on the 4th February 1862. He was recommended ... "because ... for the last nineteen years has held appointments under the War Department in various capacities as an Engineer and Inspector of Machinery, and for three years of that time has been the Asssistant Superintendent of the Royal Gun Factory, Woolwich. He designed and chiefly organized the Small Arms Factory at Enfield, and most of the other manufacturories of the War Department. He has also designed several machines of all original character, and carried out extensive works." 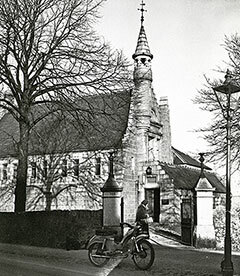 The Anderson Library (now Woodside Library), in Clifton Road, Aberdeen. Its construction was funded by Anderson and the building was completed in 1882. 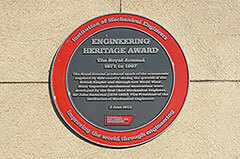 Plaque installed by the Institution of Mechanical Engineers on the wall of the former Paper Cartridge Factory at the Royal Arsenal, Woolwich. It reads: The Royal Arsenal produced much of the armaments required by this country during the growth of the British Empire and through two World Wars. 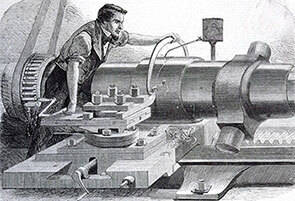 Many important mechanical innovations were developed by the first Chief Mechanical Engineer, Sir John Anderson (1814-1886), Vice President of the Institution of Mechanical Engineers. 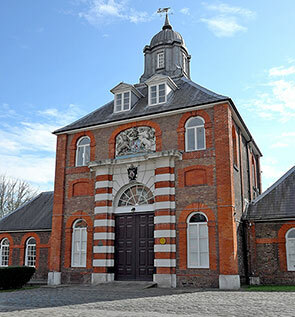 The entrance to the Royal Brass Foundry (constructed 1716-17) at the Royal Arsenal, Woolwich, as it appeared in 2014. Anderson worked here as foreman (1842-48) then as engineer (1848-59). The Brass Foundry was the first building at the Arsenal designed specifically for gunmaking, and the square tower housed a vertical gun-boring machine. Illustration (1862) of the manufacture of the Armstrong Gun at the Royal Arsenal, Woolwich. William George Armstrong (later Baron Armstrong, 1810-1900) brought his new gun technology to the Arsenal from Northumberland in 1859. He was appointed Superintendent of the Royal Gun Factory, with Anderson as his resident assistant. 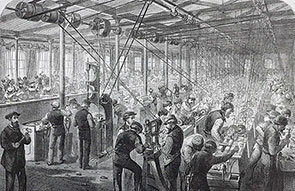 Illustration (1862) of gun-turning in the manufacture of the Armstrong's 100 pound guns at the Royal Arsenal, Woolwich. 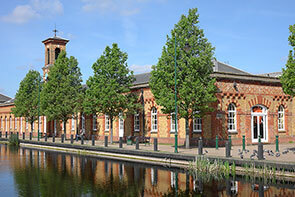 The Anderson Building at the Royal Small Arms Factory, Enfield, which was restored in 1967-9. The photo was taken in 2014. The government factory had been founded in 1816 to make rifles, muskets and swords. Anderson set up mechanised systems here after visitng the USA in 1854 to see various installations. Detail of the Large Machine Room sawtooth roof in the Anderson Building at the Royal Small Arms Factory. 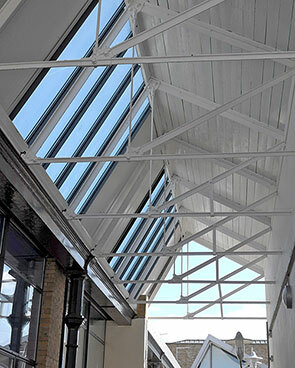 Generous north-facing skylights helped extend the possible working hours — Victorian factories were generally dimly lit.